Three awards were given to two projects designed by BVN Donovan Hill in the 2014 NSW Architecture Awards conducted by the Australian Institute of Architects NSW Chapter. The Australian PlantBank at Mt Annan Botanic Gardens received a Public Architecture Award and a Sustainable Architecture Award. According to the jury, PlantBank is “a carefully composed and sensitively detailed building,” that brings together its research and public education uses in a “well crafted whole”. As well as being a global centre for plant research and learning PlantBank is home to the largest seed bank in the Asia Pacific Region. The design of Herbert Smith Freehills (HSF) continues the changes being made to the traditional legal workplace. 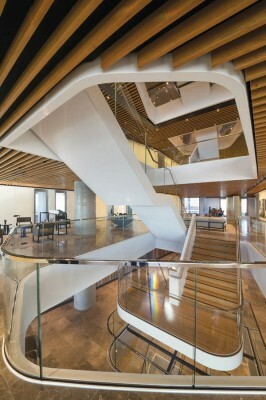 Integral to the design is a central stair that sinuously connects all thirteen floors occupied by HSF. Welcoming clients deep into a legal office would have been unheard of just a few years ago, that type of thinking has completely disappeared in the latest legal workplaces. Partners from two leading legal firms talk about the need to give their clients access right into the middle of their workplace in the latest BVN TRANSFORMATIVE that is focussed on the legal workplace. BVN Donovan Hill Principals Ninotschka Titchkosky and Bill Dowzer talk about the recent history of the legal workplace and how it is being transformed from masses of closed offices and corridors to more open spaces, sharing, often spectacular, views through using flexible building components to enclose spaces. 16 Apr 2014 8:54 AM AEST – Challenging concepts of dimensionality, three artists are staging an exhibition titled “The Power of Three” in the PARC Pavilion, in BVN Donovan Hill’s Studio at 109 Alfred Street, Fortitude Valley from 5-16 May. Open from 10am to 4pm Monday to Friday, the works in the exhibition are all for sale and there will be an opening by Nicholas Malouf on Wednesday 7 May. Whereas Adele Outteridge has been making books since 1989 from “carefully bound journals … to ‘feral’ ones using materials such as teabags, old envelopes and junk mail” and she says “My current sculptures have taken the structure of the book beyond what most people would call a book”. The exhibits are set to become talking points in themselves as they explore dimensions and concepts that should stir the most tired imaginations. Graham Bligh is a retired director of the architecture practice BVN Donovan Hill, Adele Outteridge started life as an Experimental Scientist, but since studying graphics in the 80s has become well known in the bookmaking world, and Wim de Vos migrated to Australia from the Netherlands at the end of the 50s, and has undertaken courses both here and in the Netherlands in printmaking, etching and lithography, and his work that includes printmaking, painting and sculpture is held in private and public collections in the USA, UK, Netherlands and Australia. Adele and Wim together run the Studio West End www.studiowestend.com. 08 Apr 2014 9:02 AM AEST – When Bill Dowzer speaks at the Legal Work Symposium in London on 29 April he will be showing how design ideas are taking shape in legal workplaces in Australia. 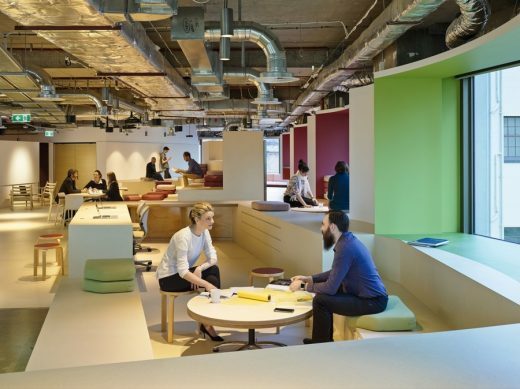 Clearly Australia is seen to be at the leading edge of workplace design to warrant an invitation to address an audience of professionals in one of the world’s most prestigious legal work centres. Bill Dowzer will be co-presenting with London based Mark Rigotti, CEO-elect of Herbert Smith Freehills whose Sydney workplace was designed by BVN Donovan Hill. It has already attracted the attention of the NSW Architecture Awards jury who have shortlisted it for a visit in the 2014 Architecture Awards programme. The topics being addressed in the symposium include: rethinking the future of the legal profession, the future of the desk and creating a client centric workspace. Bill Dowzer noted that the client was at the centre of the design for the Sydney workplace, “we embedded the client floors into the centre of the Herbert Smith Freehills workspace”. The WorkTech Legal events are a forum for workplace professionals involved in the future of work and the workplace for the legal industry. Their purpose is to allow participants to learn and share best practice on tropics from utilising space and implementing the right technologies, to facilitating a more flexible and cost effective way of working. Participants will include senior professionals from real estate, facilities, technology and executive management from the UK’s top legal firms. This building has won two awards at the 2013 Canterbury Architecture Awards. 27 Aug 2013 – The new CSU Port Macquarie campus is being designed with people in mind. Dr. Muyesser Durur, Director of Campus, today announced the appointment of BVN Donovan Hill as master planners and principal design consultants for the campus. BVN Donovan Hill has a track record of exceptional master-planning going back to the Sydney Olympics, and received both state and national urban design awards in the Australian Institute of Architects 2012 Architecture Awards for the Taronga Park Zoo Upper Entrance Precinct. According to Abbie Galvin, Principal, BVN Donovan Hill, “We recognise that this is a critical project for CSU and we are delighted at the prospect of involvement with this exciting project and the opportunity to develop an outcome that creates an activated campus that contributes to the local community.” CSU’s vision is for the “Port Macquarie campus to draw on the strengths of the region and its people to create a sustainable learning community dedicated to the growth and prosperity of the region and its people.” She noted that the aim of this early work is to deliver a framework for future development on the campus through developing CSU’s visions and aspirations for the campus, a framework that will allow CSU to evolve and thrive in the future. “We will hold consultations and workshop ideas with the people who will use and benefit from this new campus – a campus that will bring not only economic but cultural benefits to the wider Port Macquarie community,” said Ms Galvin. BVN Donovan Hill’s most recent University project, the National Life Sciences Hub at Wagga Wagga received the prestigious Blacket Prize in the 2013 Australian Institute of Architects Awards. The jury paid tribute to the client and project team “for exceeding the brief to create a high quality educational establishment that satisfied the aspirations of the individual school and the wider university. It is a model in planning, design and environmental performance for rural Australian campuses.” It is anticipated the campus will be ready for occupation in late 2015. 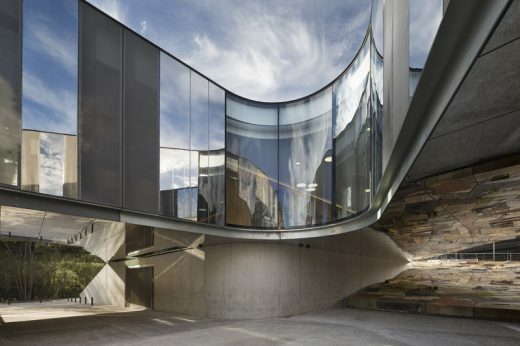 12 Aug 2013 – A research centre, a school and a church in Sydney have been selected by a distinguished group of American architects and educators in the International Architecture Awards 2013 that honour new and cutting-edge design. BVN Donovan Hill won two of the awards for The Kinghorn Cancer Centre in Darlinghurst, and for the Library and Resource Centre at Ravenswood School for Girls on Sydney’s north shore. The third award was given to FJMT for St Barnabas, Broadway that was rebuilt following a fire that devastated the original church. Both The Kinghorn Cancer Centre and the Ravenswood Library have previously been recognised with major architecture awards in Australia for their outstanding design. In September 2013, The Chicago Athenaeum, together with The European Centre for Architecture Art Design and Urban Studies will present a special exhibition of all awarded buildings at their annual symposium, “The City and the World” during the 14th International Biennial of Architecture Buenos Aires. After Buenos Aires, the exhibition will then travel inside Europe. The International Architectural Awards are the highest and most prestigious distinguished building awards program that honor new and cutting-edge design. This annual program, organized by both institutions, also promotes international architecture and design to a global public audience. The program has become the most significant and most comprehensive distinguished international awards program in the world. This year, the Museum received a record number of projects for new buildings, landscape architecture, and urban planning from the most important firms practicing globally and winners were selected from 16 countries. Mr James Grose, BVN National Director, noted ‘It is a tremendous confidence booster for Australian architects, to have Australian designs being recognised at the highest levels internationally’. June 27, 2014 in Architects.